OTTAWA - To understand why the Conservatives ended up amending the proposed Fair Elections Act, one has to look past the long list of opposition critics, academics and electoral experts who were pushing the government for changes. Nor does the answer lie with the opinion polls, which seemed to show support — or at least indifference — to the legislation's key elements. Ultimately, it was the Conservative caucus that shaped, moulded, rejected and approved elements of the bill going back more than a year. Conservative MPs and party insiders who spoke to The Canadian Press say the real story behind the legislation has been overlooked, one that involves parliamentarians who took great interest in the policy issue behind the scenes. "No bill that has been presented since 2011 has had more input from caucus," said New Brunswick MP John Williamson. "There was a willingness to listen to caucus share a wide number of views and to continuously make changes so the bill would reflect the wishes of the government caucus." When Democratic Reform Minister Pierre Poilievre persisted in calling the bill "terrific," many Conservatives knew there would be substantial amendments and in some cases were the ones pushing for the changes. Most of the public criticism around the bill has been focused on the elimination of vouching, the process whereby one citizen with identification can vouch for someone else who doesn't have the proper ID. 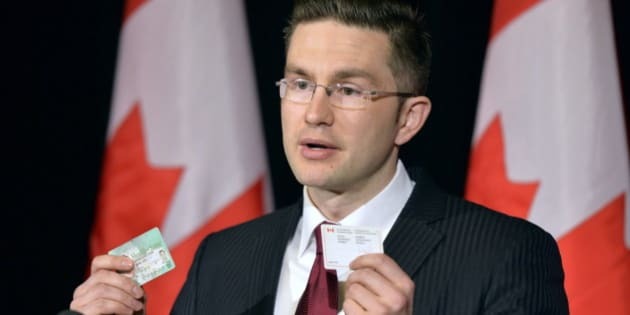 As recently as last Thursday, Poilievre appeared to be sticking to his guns on that issue, arguing that it was "common sense" for a person to prove their identity when voting. But a day later, the Conservatives suddenly put water in their wine, adding an amendment that would allow would-be voters without proof of address to cast a ballot after signing an oath attesting to their local residence. Voters would still be required to provide some proof of personal identification. "If anything, this shows this was not a secret, partisan ploy to alter the playing field," said one MP, who — like many others interviewed — spoke on condition of anonymity because they weren't authorized to discuss the matter publicly. "We had already won the (public) fight on vouching." The main impetus for the change, according to some MPs, was the feeling that the measure would soon be challenged as unconstitutional in court — something nobody wanted. Inside caucus, different models for vouching were tossed around, including one called a "tendered ballot" that would allow people without the proper ID to vote, but then have their information verified later. This would come in handy in cases where a close election result would require close examination of ballots. None of this was apparent from listening to Poilievre, however. Although the minister has the support of caucus as someone who knows the file inside and out, there was a degree of unease over his public relations approach. "It was more about Pierre's tone in public — he had that smirk on his face, and it wasn't believable changes were going to be made," said one MP. Ironically, it was the actions of a Liberal that spurred so much interest in the legislation inside the Conservative caucus. In the 2011 election, former MP Boris Wrzesnewskyj lost his seat to Conservative Ted Opitz by a razor-thin 26 votes, and took his allegations of irregularities — including vouching errors — all the way to the Supreme Court. Wrzesnewskyj ultimately lost, and Opitz kept his seat. But Conservatives vowed internally never to let such uncertainty happen again. Poilievre's predecessor, Tim Uppal, helped to prepare an electoral reform package a year ago, but it was shelved just before its release. Conservative insiders say there was internal criticism that the original bill did not adequately address the vouching issue. A proposal for an oversight panel within Elections Canada that would include chief electoral officer Marc Mayrand also did not go over well. Some felt Mayrand himself ought to be subject to oversight. The legislation went back to the drawing board. A compromise was reached, placing the Commissioner of Canada Elections, who undertakes investigations, under the oversight of the director of public prosecutions. But Mayrand would go on to form an advisory panel anyway, appointing figures such as former auditor general Sheila Fraser, former Reform Party leader Preston Manning and former interim Liberal leader Bob Rae. Mayrand is an ex-officio member of the panel. The move would only exacerbate the already tense relationship between Mayrand and the government — one that shows no signs of improving. "The government doesn't want an elections system that is biased, they don't want to discourage voting, they don't want to advantage themselves in the elections laws — this is not what this is about," said one MP. "It's about exactly the opposite. All the government wants is a fair and level playing field and an elections oversight body whose impartiality is beyond reproach."